Conestoga wagons with queen-sized beds, heating and air-conditioning? The pioneers would scoff at such luxuries — or maybe not. Had they lived about 200 years later, they might have enjoyed oversized beds, luxury linens, indoor plumbing and someone to build their campfires. Sounds rather glamourous and it is — and that’s why they call it “glamping” — and that’s what you’ll get at Conestoga Ranch. Located in northeastern Utah, the 37-unit ranch is one of an ever-growing number of such resorts that offer glamping. 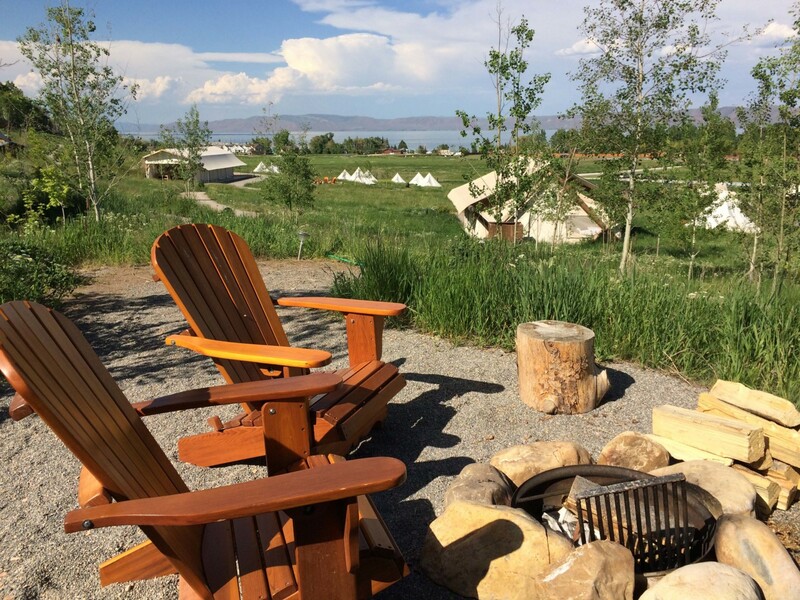 Its 35 acres of wildflowers, custom-made Conestoga wagons and luxury tents are located just a handful of miles from the Idaho border. The hillside property overlooks Garden City (population 562) and the stunningly beautiful Bear Lake. In this second week of June, the lake’s 109 square miles of deep turquoise water is hugged by a ring of mountains that are still dusted with snow. Tents come in two sizes: Traditional (the smaller size without as many amenities), and Grand, where we are happily residing. Ours has sturdy canvas walls and heavy cable anchors — the winds can be formidable here — and that’s where the resemblance to a tent ends. We have a king-size bed, dark hardwood floors accented with a pastel Persian rug, an antique dresser and cedar chest for storage, a safe, mini-frig, heater, fan and a broom to swat the occasional flying or crawling critter. 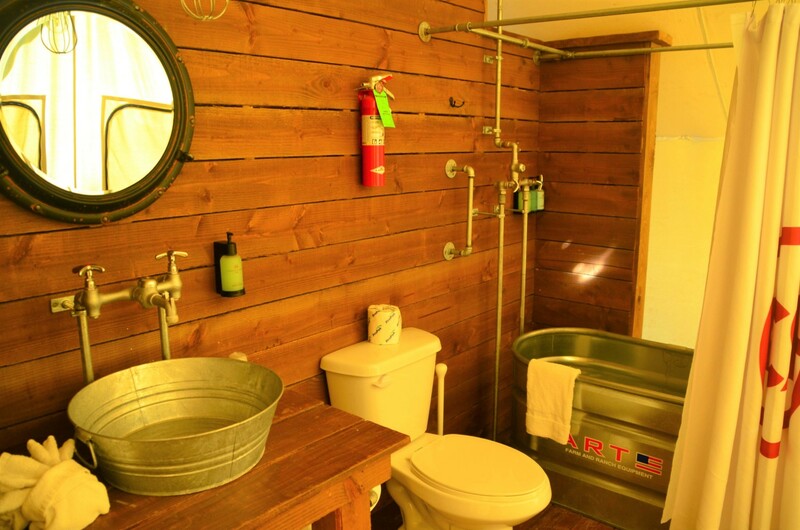 And perhaps best of all, our tent includes an en suite bathroom — toilet, sink and shower in a country-washtub motif. No need for lanterns or flashlights, either (although the latter is probably a good thing to have) because our not-so-rudimentary accommodation also is electrified. And the view of the lake, mountains and carpet of blue flax is pretty electric, too. Our Grand Tent is perched at an altitude of about 6,000 feet, so as lowlanders, we are a bit winded after climbing to our patio on the first night, but no worries. When a campfire to illuminate the crisp Utah night is in order, we call Kaiden, a chatty, soon-to-be, high-school junior who is this evening’s designated maintenance man. He is more than happy to build our fire and fill us in on the local scene. Summer is just getting underway in northern Utah, so the ranch is fairly quiet tonight, but come the weekend, Conestoga Ranch is fully booked. 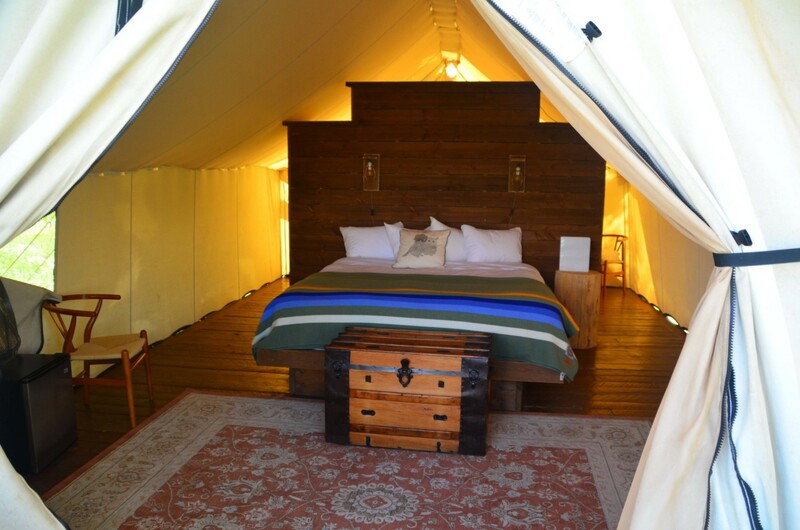 In addition to the Grand Tents, the choices of lodging are the Traditional Tents (smaller and with less amenities than the Grand Tents), and the Conestoga wagons. Towels and bed linens are provided. Glampers who choose the wagons and smaller tents can use the six modern, private, immaculately clean bathrooms with large showers. (One bathroom is accessible.) Glampers also can bring food or dine at the Campfire Grill, an open-air pavilion which serves breakfast, box lunches and dinners. We enjoyed Chef Vince Liberato’s version of meatloaf and shrimp ‘n’ grits, both excellent. The ranch is an easy two-and-a-half-hour drive north from Salt Lake City, which is a less-than-two-hour flight from San Diego. The drive takes you through verdant Logan Canyon where the water is running musically high and fast after a winter of generous snow and a spring of ample rain. Garden City celebrates all-things-raspberry during its annual August festival. Even though it is only June, though, we find the largest and thickest raspberry shake I’ve ever tackled. The area provides lots of options for fun: paddleboarding, boating and kayaking on Bear Lake; Sea-Doo rentals; hiking and biking; and horseback riding. For a unique side trip, drive 30 minutes north across the Idaho border to Minnetonka Cave. Visitors get a fascinating 90-minute guided tour that takes them hundreds of feet below ground to learn about stalagmites, stalactites and cave bacon. 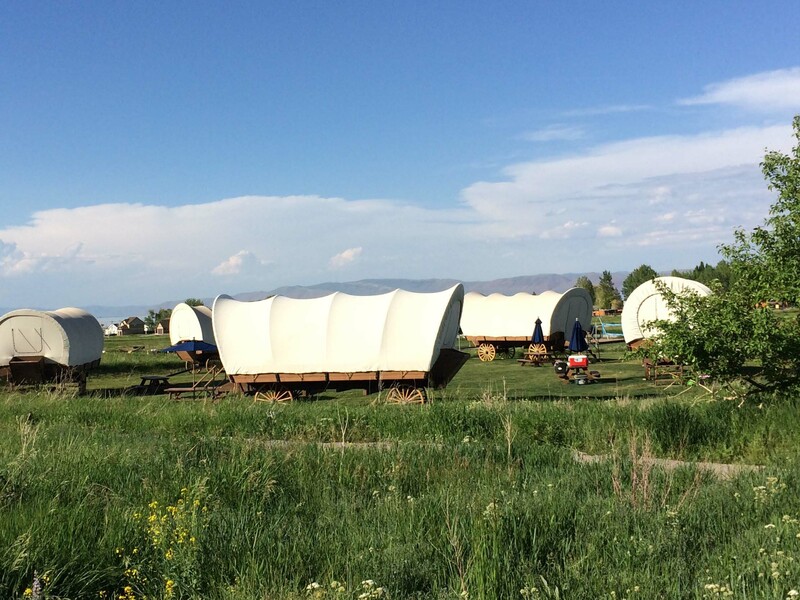 Wagons at Conestoga Ranch can accommodate up to six; tents up to eight. Rates start at $155 ($147 for military). Visit www.conestogaranch.com, or call 844-Go-Glamp (464-5267).